Photo by Bro. Jeffrey Pioquinto, SJ on Flickr and used here with Creative Commons license. As long as humanity has existed, so too have humans been cheating to get ahead. College campuses act as microcosms for all manner of social discourse working itself out – the poignant, innovative and repugnant among them. So it comes as no surprise that, when you drop students into high-pressure academic settings, some 75 percent of them will admit to cheating at least once before they graduate. “If you’re not cheating, you’re not trying!” an acquaintance, who’s pursuing her college degree part time online, told me. Like all the students and recent graduates I spoke with for this story, she asked me not to use her real name. Although research shows cheating (or “academic dishonesty,” the preferred disciplinary code parlance for the cluster of behaviors to get something for nothing) isn’t necessarily more common online, students are actively working at it. Sophisticated, high-profile cheating rings have been uncovered at schools like Harvard, UNC-Chapel Hill, and Dartmouth. But unfortunately for students, schools are also getting better at catching online cheaters, with a bevy of tools now at their disposal. There are certain online courses that are widely known for their opportunities to cheat, Glenn (not his real name), a 2015 graduate from a top school, told me. So Glenn chose to take classes that fulfilled his general requirements, rather than key courses to the major, online. He said his cheating ranged from the garden variety – like handing in a former student’s old assignments (for which he was also caught once, when he forgot to change the name on the work) – to coordinated strategies with groups of classmates, including picking a rotating “sacrificial lamb” to take the online test first and bring back the questions back to the group. Collaborative work that doesn’t involve cheating can often be an important part of online courses. Photo by hackNY.org on Flickr and used here with Creative Commons license. One online summer term course was such a well-known hub for academic dishonesty, he said, that students throughout the years had developed a more refined, mechanized means of rigging the system. Nearly 150 students in the 200- to 300-person course were members of a collaborative Google Doc, with a test question matrix created to workshop and peer review answers to every possible test question. 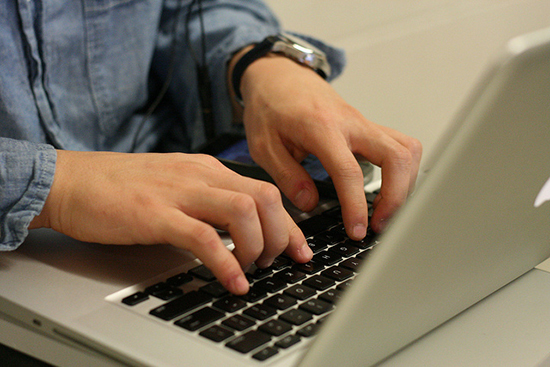 While Glenn is acutely aware of the disadvantage posed to the minority of students who were not part of the “in group” sharing the document, he has no qualms about cheating in online coursework, calling it a “victimless crime.” He also questioned how the practice had been allowed to persist for so long, when the class’ grade distributions would have made it obvious that something was afoot. “We’re not taught to learn the material. We’re taught to get the highest grade possible,” he said. In the same way Glenn says he’d never steal a physical CD from a store but downloads musically illegally with impunity, he views online courses without external monitoring as creating an environment that invites cheating. “We’re there watching them at all times,” a ProctorU staff member says in a sales pitch for the remote test proctoring service. It’s a tool that attempts to replicate the control of an in-class test taking experience, with a live proctor appearing through a video call at the appointed exam time to prompt a multi-factor process to verify a student’s identity. 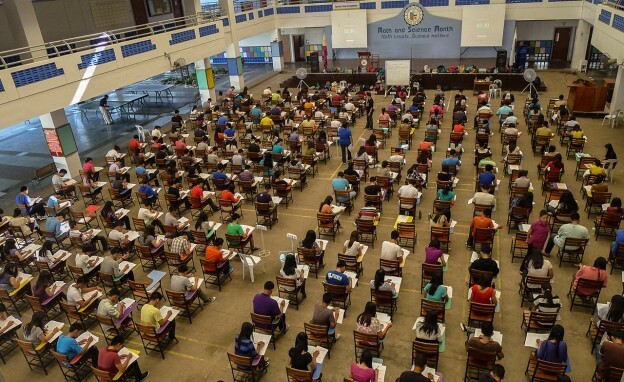 The proctor will also ask the student for a 360-degree plan of the room and a view of the student’s computer screen before the exam starts. Screen-sharing technology also allows the proctor to monitor what’s happening on the student’s screen throughout the test. Photo by hackNY.org on Flickr and used here with Creative Commons license. And the business of deterring cheaters is booming. Franklin Hayes, a company spokesman, told me that the company now has more than 700 partner institutions (up from just 30 four years ago) and some 600 employees. 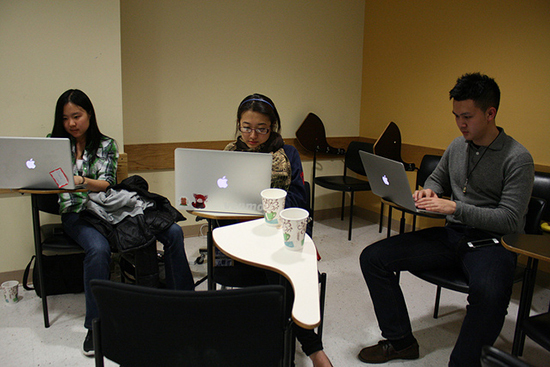 Since its founding in 2008, proctors have monitored more than 1 million exams, and thousands of tests are taken daily. ProctorU bills schools, students or a combination of both by the hour, generally at a rate of $25 for a two-hour exam, Hayes said. Another widely used service, Turnitin, is a cloud-based application to catch plagiarism, or what the company calls “highly unoriginal content.” After students upload written work, Turnitin compares the student’s work against 110 million items for publishers and journals, 45 billion websites and another 400 million student papers, and generates a report scoring the work for “similarity” with other sources. Turnitin boasts 1.6 million active instructors and 10,000 institutions as customers – half of all U.S. higher education institutions. And it doesn’t stop there: programs like Coursera can track students’ typing rate and rhythm as a means of detecting when the wrong person is taking the test and installing anti-cheating hardware can be used to confirm a student’s identity from a palm print. The use of facial recognition software like Proctortrack to verify students’ identities remotely is also expanding. “Cheating is not something you can eliminate,” he said. Other leading voices have called for researchers to pool their resources to develop better tools. “Unless the testing industry also pools its resources, we’re always going to be playing this game of catch-up,” he said. Katherine Krueger is New York City-based writer and reporter. She is an editor at Talking Points Memo, a political news blog, and a graduate of the University of Wisconsin-Madison. You can find her tweeting frequently @kath_krueger.